For many gardeners, roses (Rosa spp.) are the undisputed queens of the garden. As much as they are known for their beauty, however, they are also known for their temperamental nature. 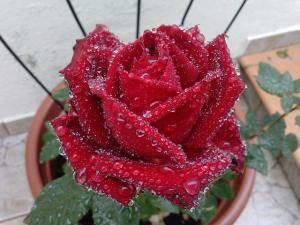 It pays to understand the best practices for disease prevention and the best types of roses for different environments. Roses are woody shrubs and vine-like plants, of which there are many types that are found throughout the temperate regions of the world. They range from tiny groundcovers less than a foot tall to enormous shrubs over 10 feet tall and vines that clamber up to 30 feet. Roses are commonly available in nurseries everywhere. In terms of climatic preferences, the majority of roses are rated for USDA zones 6 to 8, though there are varieties that grow well up to zone 10 and special northern climate roses that can survive as far north as zone 2. There are also ways to winterize roses that are growing on the colder edge of their range to prevent them from freezing. Besides their satiny petals, which are typically white or rose-colored on the original wild species, roses are known for their thorny stems. However, this trait has also been bred out on some modern varieties. Today, roses are available in almost every color of the rainbow except blue. Wild roses have small flowers that hardly resemble most of the roses grown by gardeners today though they do have the classic rose fragrance. Modern rose varieties are the product of centuries of selective breeding and hybridization, which have often sacrificed disease resistance for the sake of aesthetics. Most modern roses prefer full sun though thanks to the genes of some of their wild forest-dwelling cousins, they will generally grow in part shade but flowering will be reduced. Rich, well-drained soil is the foundation for growing healthy roses. Slightly sandy and slightly acidic soil is ideal, but other soils can be modified to make them more conducive to growing roses. Once they are well-established roses can tolerate a bit of drought, but regular moisture is generally a prerequisite for growing roses successfully. 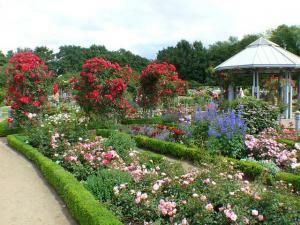 Roses are often used as a specimen plant in formal landscape designs because of their showy flowers. However, the showiest roses often have the least attractive form overall and are best when inter-planted with complementary species, such as flowering groundcovers, bulbs, and other low-growing perennials. 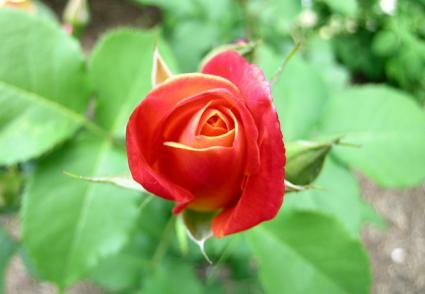 Roses have also been bred for many specific landscaping applications. Round and shrubby roses make a good hedge or screen. 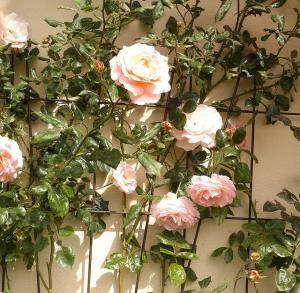 Climbing roses are a classic plant for growing over arbor entryways and pergolas. 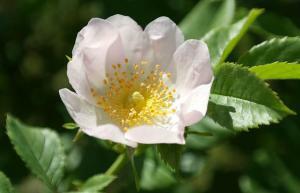 Groundcover roses are good for massing on large slopes where they are helpful for erosion control. Roses are well-suited to container culture as the optimum soil conditions can be easily provided. Any rose can be grown in a pot, as long as it is big enough, but the dwarf roses are most commonly grown in this way. There are ultra-tiny roses that can even be grown as a living centerpiece on an outdoor tabletop. Roses are typically planted in fall, late winter, or early spring. Late winter is prime rose planting season when most nurseries stock a wide selection of bare root roses, which are dormant rose plants sold with their roots wrapped in plastic or burlap. The planting area should be prepared by incorporating a three-inch layer of compost to a depth of six inches in a two-foot radius around the point where the rose will be planted. If the soil has a high clay content, rake the soil into a low broad mound before planting. Dig the hole to the depth of the root ball and about twice as wide. It's important to not plant the crown of the roots below the soil level. Digging the hole deeper than the depth of the root ball means there will be loose soil at the bottom of the hole, which will eventually settle and cause the root crown to drop below the soil line - one of the classic mistakes in planting roses that contributes to many disease problems. Understanding rose care is the key to healthy roses. Roses should be watered on a weekly basis and fertilized monthly with an all-purpose fertilizer during the growing season. Maintaining a layer of mulch over the roots is a good practice, but make sure it doesn't pile up against the trunk. Rose blossoms should be trimmed off as they fade and the plants benefit from a heavy pruning in late winter while they are still dormant. Roses can be cut back to 50 percent of their size without causing harm and this helps to keep them compact and bushy and prevent the accumulation of diseased stems and foliage. 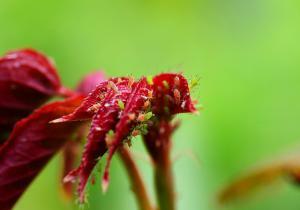 Aphids, scale, whiteflies, mites, and other sucking insects are very common on roses. mild infestations can be washed off with a sharp blast of water from the hose or by spraying with insecticidial soap. Chemical insecticides are often necessary for heavier invasions. Roses are subject to numerous viruses and diseases. Treatment, if possible, generally involves spraying environmentally-unfriendly substances, so focusing on prevention is the best approach. Look for disease-resistant cultivars. 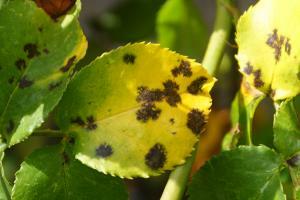 This information is often available on the label, but you can consult with your local cooperative extension office about the most common rose diseases in your area and the varieties best suited to withstanding them. Always prune out any diseased wood as soon as it appears. Sterilize pruning equipment with a solution of bleach and water mixed at a 1 to 10 ratio. Water roses at ground level with a soaker hose or drip system to keep the leaves dry, which helps to stem the spread of many pathogens. Roses are imbued with deep cultural significance and meaning, making them an essential member of the garden. By learning more about the many types of roses and how to grow them, gardeners can earn the privilege of harvesting their sumptuous blossoms to share with loved ones.